Slimming World Diary: PB Best Record Broken! My Journey To Getting Slim.. So just got back from doing some exercise in the pool. I have just broken my personal best of 50 laps and done 60, I'm ecstatic, I really am. I have never done this much swimming, I don't even like swimming that much. Ha ha. I was lagging when it came to 55 but me and Gareth really pushed ourselves and really tried and I am quite proud of us. I am hurting and I'm most likely going to feel it tomorrow but it will be worth it! Before I went swimming I made Beef and Bean Hot-Pot Bake for dinner. Yes it's the return of the one pot but I love them, I really can't stress enough how easy they are. 1. Preheat oven 180c/Gas 4. 2. Place the beef, onions, carrots and flour in a baking dish, season and toss to mix well. 3. Pour in the boiling hot stock, then add the Worcestershire sauce, baked beans and bay leaves. Stir to mix well and arrange the slices of potato on top of the meat mixture. 4. 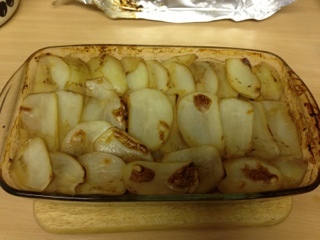 Cover with foil then place in oven for about 1 and a 1/2 hours or until the potatoes are cooked and tender. 5. Remove foil, then turn the oven up to brown the potatoes, or finish under grill for 5-8 mins until brown. I served mine with some greens and it was gorgeous, serves for and it's 1 syn each serving. Rubbish Tip For Loosing Weight .. Meal Plan for the Week .. Pushing It In The Gym ..